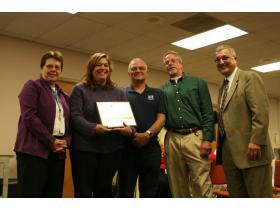 Energy Education presented Lincoln with an environmental excellence award for environmental and financial resource stewardship. From left, Superintendent Lynn Cleary, School Board President Kimberly Samuelson, Jim Harless, Bob Grosshans and Michael Bitar. Oct. 14, 2009 · 2:43 p.m.
Lincoln Consolidated School District reported it has saved more than $380,000 in energy expenses this year. That’s nearly 30 percent in energy savings according to Bob Grosshans, the district’s energy education specialist. Lincoln launched its energy program three years ago with help of Energy Education, a Texas-based energy consulting company. In the district’s three years with the program it is estimated the cumulative greenhouse gas reduction is equivalent to 1,035 passenger cars not driven for one year and 147,466 tree seedlings grown for 10 years. “Quite a large carbon footprint has been eliminated through our energy savings over the last three years,” Grosshans said at Monday evening’s board of education meeting. The four-year program with Energy Education will continue until the end of next year, when the district’s contract with the company is finished. In the three years the district has been working with the company, it is estimated Lincoln has saved $988,000. Energy Education calculates savings by subtracting the expected energy cost - the district’s base year energy consumption, adjusted for changes in weather, equipment, schedules, occupancy and prices – from the district’s actual energy cost. Lincoln pays Energy Education $109,000 a year for consultation and approximately $21,000 a year to Grosshans, a retired Lincoln teacher. The district’s net savings in the past year was $280,000. Lincoln expects to spend approximately $135,000 in its final year with Energy Education. “This is money that DTE doesn’t get, Excelon doesn’t get, it stays in the district and that’s the important thing, Grosshans said. Most of the energy savings are realized in the summer months when the buildings run less electricity. As an energy specialist, Grosshans works with the district's maintenance staff and other district employees to help reinforce energy saving techniques that can range from difficult jobs, like fixing exhaust fans and ventalation systems, to simple jobs, like making sure the lights are off. Skilled Maintenance employee Jim Harless, who oversees the district’s energy management system, said the Energy Education program has been very valuable. Harless said Groshann’s has found a lot of unnecessary energy consumption in the building that would have gone unnoticed otherwise.